Dean Emerita, Phyllis Ivory Vroom - Formerly Dean of School of Social Work, January 2002- September 30, 2011, (Interim Dean from January 2000-December, 2001), is a longtime member of the faculty, having joined the School of Social Work in 1969. She has served in curricular leadership roles first as coordinator of the BSW Program, from 1973 to 1986 and as coordinator of the MSW Program from 1987-1988. 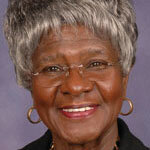 She served as Associate Dean from 1990 to 1999. Her areas of expertise are social work practice with African-American children, youth and families; social work in urban middle schools, and social group services. Within the community, Professor Vroom currently serves on the board of the Black Family Development, Inc. In 1996, the Michigan chapter of the National Association of Social Workers presented her with a Lifetime Achievement Award.